Projecting Quaid-e-Azam as ‘secular’ is treason? The #fakenationalists have been targeting progressive Pakistanis for some time, aided by the #DirtyTricksBrigade, but their desperation has intensified of late. Is it a coincidence that a treason case has been filed against those identified in this defamatory poster, along with others? 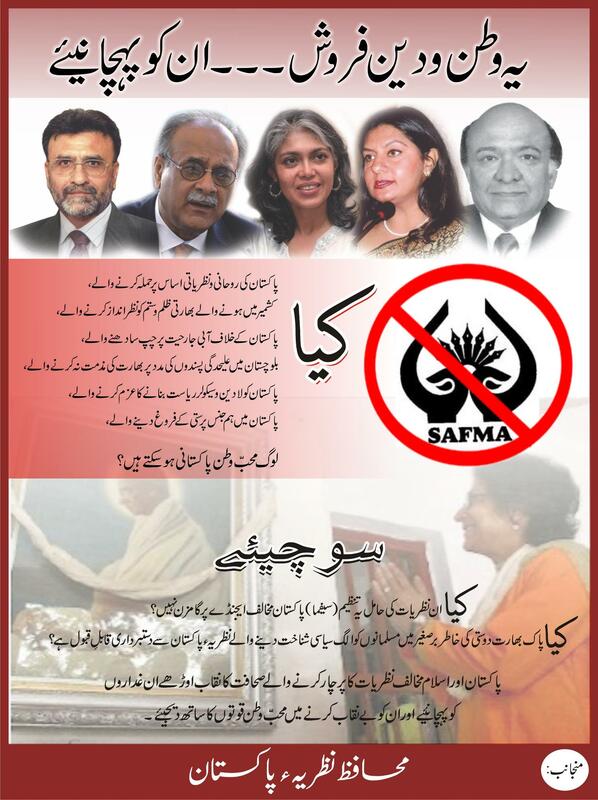 The poster, uploaded on facebook on March 13, 2012 by an APML supporter, features (left to right) Nusrat Javeed, Najam Sethi, Beena Sarwar, Marvi Sirmed, Imtiaz Alam. The text identifies us as “sellouts for religion and country” set on an “anti-Pakistan agenda” along with the South Asia Free Media Association (SAFMA) (that most of us are not part of). It ends: “Come join the patriotic forces to unveil these traitors of Pakistan who hide behind the veil of journalism”. UPDATE: May 8, 2014 – The Supreme Court of Pakistan admitted Zaid Hamid’s petition filed two years ago, seeking a treason trial against Asma Jahangir and several journalists for allegedly undermining the Two Nation Theory and glory of Islam. Coming just days after the April 19 attack on Hamid Mir (one of the ‘treason’ case respondents) and subsequently Geo TV, is this development a coincidence? On March 28, 2012, lawyer Ahmed Raza Kasuri filed a petition for high treason (under Article 6, punishable by death) on behalf of the so-called ‘security and defence analyst’ Zaid Zaman Hamid in the Supreme Court of Pakistan, Islamabad, against 17 respondents whom the petition terms ‘snakes’ (including your’s truly). Our alleged crimes include “Trying to project Quaid-e-Azam as secular leader, lowering the image of Allama Iqbal, aggressively attacking the image of armed forces and ISI”. The respondents include the prominent human rights advocate and former President of the Supreme Court Bar Association Asma Jahangir and journalists Najam Sethi, Marvi Sirmed, Nusrat Javeed, Sirmed Manzoor, Ali K. Chishti, Khaled Ahmed, Imtiaz Alam, Hamid Mir, Hasan Nisar, and myself. The DG ISI, Ministry of Interior, Foreign Ministry, Chairman PEMRA, Law Ministry and of course the biggest ‘snake’, SAFMA (South Asia Free Media Association), were also made respondents. The petition was preceded by a facebook post (repeated on twitter) on the Zaid Hamid official page. “Today, we have filed a Petition in the Supreme Court against SAFMA for High Treason against Pak Sarzameen, its sacred ideology, its beloved founding fathers and waging a war against Pak Sarzameen, armed forces and our freedom on behalf of the enemies. It continues along these lines – and he subsequently complained that “Pakistani media is blocking the news of our war against SAFMA. The snakes have joined hands to protect their their system of lies, deceptions and deceit…” – the post at his facebook page has a poster and quote of Malcolm X about the media to illustrate the point (!!). We do not yet know whether the SC will admit the petition in the first place. The text is actually quite funny, replete with typos, and the so called PakNationalists (known on twitter as #fakenationalists) are clearly desperate. Even if the case is not dismissed in limine it is unlikely to progress much. And if it does we will fight it inside and outside the court. More later. Beena, you guys are doomed. CJ himself said “we can not let this country become secular…” or something on those lines. Now is his chance. Good luck with the azad adliyya. How much I wish I had not supported them in the first place. It ll be rejected .Intrestinongly ,if Honourable court accept the petition and ask the reply of said parties ,then have opportunity to present their stance in the court of Law.Which ,i believe give respondents not only an opportunity to get the petition dismissed but also file defamation suit against petitioners. Petitioners themselves digged their grave and it is best opportunity to explain the word “Liberlism” .They just need to prove that being liberal doesnot mean anti-Pakistan.Hopefully some good material ll come on the surface. all this only for projecting Qaid e azam as secular………what would happen to people like me who call ISLAM ALSO A SECULAR FAITH!! … hato bacho!! Anywhere in the whole world, wrongly projecting Founding Father, national ideology, national identity, national security institutes and national history amounts to HIGH Treason. There is NO proof that Quaid-e-Azam was a secular OR supported secularism OR selected secularism for Pakistan. So, project Quaid-e-Azam wrong amounts to HIGH TREASON without a doubt. I will refer you to Jinnah’s first address to the parliament of newly born Pakistan. This country was made so ALL people, Muslims in particular, could live without the fear of being discriminated against by Hindu majority of a joint Hindustan. Pakistan was not supposed to be a country for ONLY Muslims. Quaid said that you are free to pray in your masjids, and temples and churches and synagogues in peace and without religious intolerance. No Religion shall have a say in the matters of state and judiciary for laws of Pakistan are to be made for all human beings that dwell in this part of world. That is the only way for us to rise as the great nation that Quaid had foreseen. Quaid-e-Azam, is one of the greatest leaders of all times and he was very much a secular because he believed in religion being a personal matter of every individual. That is not to say that he himself had no spiritiual emlightenment or that he did not have faith, but that He had meant for Pakistan to be a secular country where debate of ideas could flourish, not shunned by religious dogmas. This is exactly what an Islamic State is to be, to secure the rights of minorities. This is the fundamental right of a citizen in Islamic State to have freedom of faith. This is exactly what the Prophet (s.a.w.) did after establishing the state of Medina. Read yourself the charter of Medina in which the minority rights were fully secured, and they were allowed to practice their faith, religion or anything, no matter to what religion they belong. State has nothing to do with the personal faith of the citizens, and its the duty of state to protect them. The state religion would be Islam and all laws would be made according to Quran, and this is the Sunnah of the Holy Prophet (s.a.w.) which Quaid-e-Azam followed right after establishing the state of Pakistan. The petition against SAFMA is a reaction to the lies and confusion spread by its members in the media against 2 Nation Theory, Pakistan Army, ISI and painting Quaid-e-Azam a secular. Therefore. projecting Quaid-e-Azam a secular amounts to High Treason by all counts. In all speeches of Quaid-e-Azam, he never uttered the word ‘secular’ or ‘secularism’. Public get deceived by his outlook & dress code and think & project him as secular. Even the western countries, which are looked at as a role model of freedom of speech, media never bash their own ideology, intelligence agencies, army and founding fathers. ‘Absolute freedom of speech’ is no-where in the world. The caption under the poster mentions Imtiaz Alam twice and missed Najam Sethi. Oops, thanks for pointing out the error. Fixing. When jinnah talked about dividing India, no one called him traitor and agent of British. that was over 70 years ago. one would think that society would be more mature and tolerant to other people’s opinion decades after that. I wonder why the lawyer concerned did not include ZAB (and his party, of course) whom, in a discussion on foreign affairs in the National Assembly, I had heard calling him (the lawyer) a monkey, with whom he was fed up.